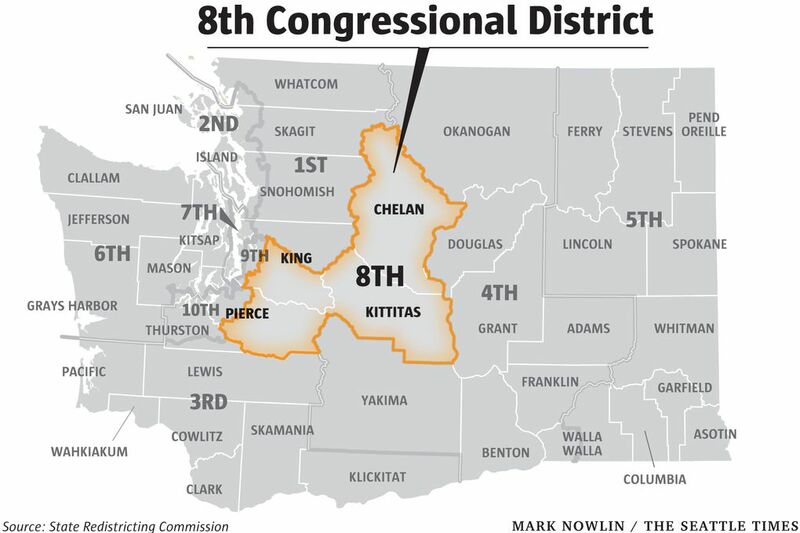 Washington's most closely watched Democratic congressional primary has gone negative with accusations over a doctor's position on mandatory vaccinations. Top issues in the 2018 midterms: Trump, Russia, trade and … vaccines? 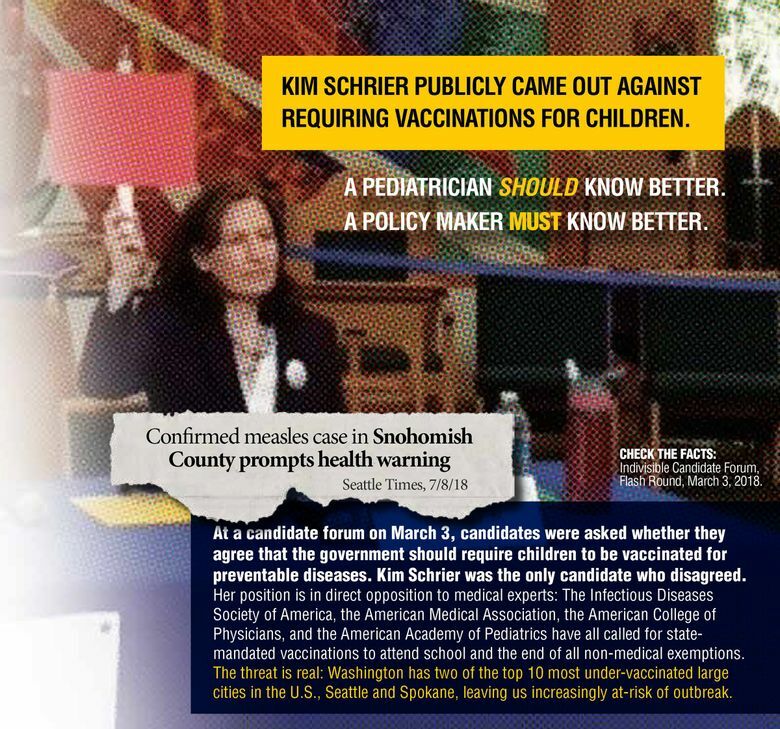 In a combative twist in Washington’s 8th Congressional District primary, a Democratic doctor is out with mailers accusing her doctor opponent of opposing mandatory vaccination of children — drawing angry denials and counter-charges of dishonesty and desperation tactics. The vaccination barb is being lobbed by Shannon Hader, a former top federal public-health official, against Kim Schrier, a longtime Issaquah pediatrician who has led Democrats in fundraising and polls as mail voting in the Aug. 7 primary begins. Hader’s mailers point to a single moment at a March candidate forum in Sammamish, while omitting Schrier’s subsequent public statements. At the March event, candidates were asked during a rapid round of “flash” questions to hold up signs saying whether they agreed or disagreed with various statements. 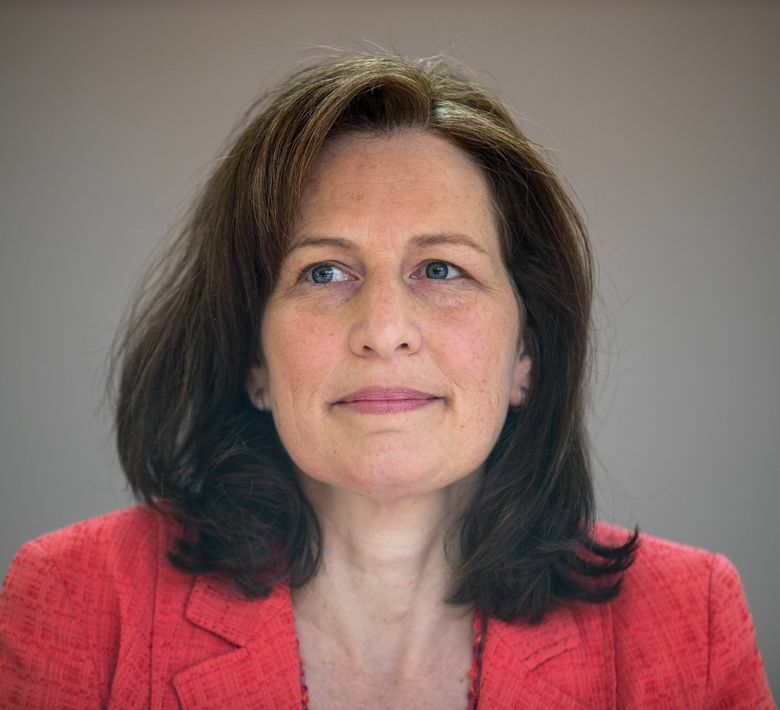 Asked whether “the government should require children to be vaccinated for preventable diseases,” Schrier held up a red sign indicating she disagreed. Hader and Jason Rittereiser, the other Democrats at the event, each held up green signs indicating they agreed with the statement. Schrier did not clarify or explain her answer at the time, but after earlier criticism she repeatedly said she supports mandatory vaccinations and that she has administered thousands herself during 17 years as a pediatrician at a Virginia Mason clinic. She says she misheard or misunderstood the question at the forum. Hader’s mailers ignore Schrier’s explanations. “A pediatrician should know better. A policymaker must know better,” the pieces say. They also flag a recent measles case in Snohomish County and tout Hader’s own experience as a director at the Centers for Disease Control and Prevention. In an email, Hader spokesman Mike Bush said the mailer highlights “an important policy difference that emerged between Dr. Hader and Dr. Schrier on the campaign trail. The voters have a choice in this race, and this policy difference is a real choice between the candidates.” He said Hader supports government policy that would make no exceptions to vaccination requirements, unless there are medical exemptions. 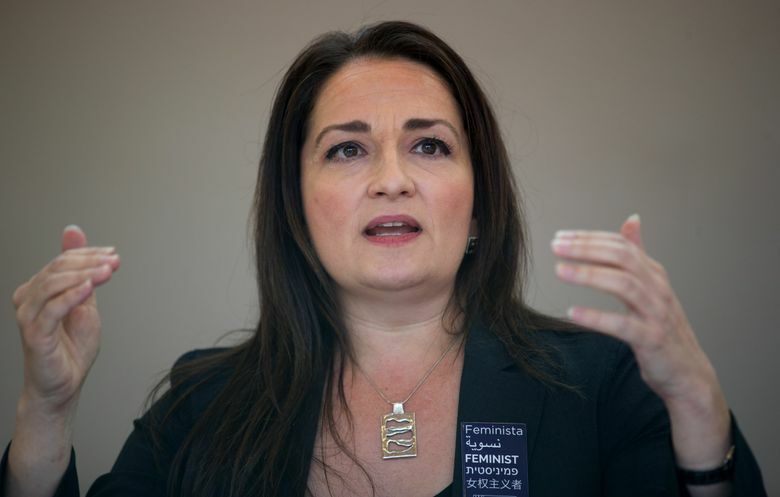 But Schrier spokeswoman Katie Rodihan rejected that, saying there is no policy difference and that Schrier herself has administered 100,000 vaccinations. “Kim has repeatedly said that she supports only medical exemptions. Again, Hader knows this, and for her campaign to pretend otherwise is dishonest. It’s also worth noting that ‘policy difference’ is not what her mailer said — Hader clearly knows her attack overreached, and now she’s trying to figure out a way to backpedal out of a political lie,” Rodihan said in an email. Bush responded that Schrier’s statements on vaccinations have shifted over time, and have included support for Washington state’s policy, which allows for non-medical exemptions to vaccination. The Democrats are pushing to advance past the “top two” Aug. 7 primary and take on presumptive Republican nominee Dino Rossi, who is no doubt relishing the Democratic primary feuding.